As Congress returns from the Fourth of July recess, one of the first pieces of unfinished business it hopes to address is the rising interest rate on federal student loans. Specifically, the interest rate for newly originated subsidized Stafford Loans provided interest free until six months after graduation to students with a financial need rising from 3.4 percent to 6.8 percent. 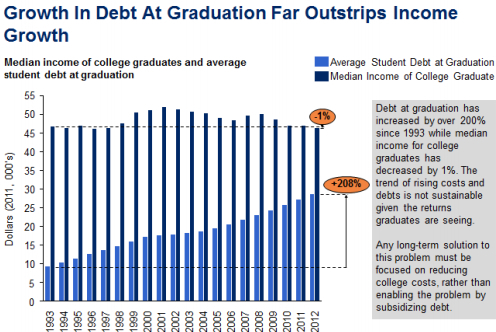 While subsidized student loans comprise just 25 percent of all federal student loans, the overall issue of student loan debt has the potential to become a significant drag on the economy, with debt now totaling nearly a trillion dollars and 17 percent of borrowers delinquent in their repayment.1 And these macro dynamics are set against the backdrop of rising costs in higher education coupled with comparatively lower financial rewards.